He’s into the heavy stuff; the little Bosch power plane is really earning its livlihood right now. 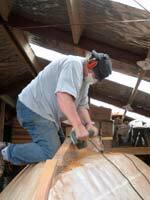 That big hardwood deadwood forms a veritable wall down the backbone of the boat. It does not look like a lot on the plan, and 900mm draft is only about 3 ft when the norm for small and midrange cruisers is 4ft 6 to 5 ft but when the boat is only 6.5m and it’s a full length keel the proportions mean that this is a lot of lateral plane area for the size of boat. At 140mm (5 ½ inches) thick there is a lot of volume in there, so by using a wood which is close to the same weight as water that volume is not trying to float up, meaning that the ballast is much more effective. Assuming that the wood is close to double the weight of the more common durable softwoods used elsewhere in the boat it probably counteracts about 125 kg of buoyancy low down which is a huge plus in terms of the boats stability. Its a slow and noisy job planing the deadwood smooth and getting the beginnings on the foil shape on the leading edge, not only noisy but the dust is nasty stuff to breath so its on with all the protective equipment. There is a capping to go on that leading edge yet, and another big piece of hardwood to go on the after section of the keel. Lots of shavings, and a lot of freehand work with the planer to get it all smooth and streamlined. The keel was built up by stack laminating 70mm thick layers of wood, screwing cleats on the sides of the stack so each additional layer could be clamped in place. We used big lumps of architectural stone to hold the first couple of layers down and worked up from there. 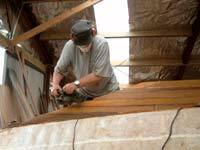 Building that way means that the sides are a bit ragged, stepped in and out with lumps of glue squeezed out from the joints and splinters ready to spear the unwary hand. So there is a really major smoothing off job to be done, hence the power plane. LOTS of shavings! That little plane by the way is a Bosch PHO 16-82 550 watt handyman grade power plane with rebate facility and a single replaceable tungsten carbide blade. I admit that I bought it because it was cheap, it had been part of a window display on the sunny side of a shop, and along with the other tools had faded in colour. That plus the arrival of a new range from the manufacturer meant that I got the power plane and a lightweight jigsaw for half price. They are both light in weight, easy to use and seem to be surviving the hard use very well. While I prefer to buy commercial level tools, for a handyman doing the occasional project I’d say that both of these tools are fine. We are off to Tauranga on Monday, off to visit Tony Thornburrow our sailmaker who is putting his heart and soul into Charlies sails. We are benefiting greatly from his experience and from his commitment to doing the best possible set of sails for Resolution. I suspect that this boat, its planned voyage and the dreams and adventures that go with it really do appeal. Heres the ad: Thornburrow Sails are good sails!!! Tony is a good guy who does a very good job for us whether it’s a Tender Behind with that tiny lugsail, Navigator with its yawl rig or Charlies heavy displacement gaff topsail cutter with the heaviest storm sails I have ever seen on a boat of this size. Also (here's the other ad) we are going to visit Moxon Timbers across the harbour in Mt Maunganui. 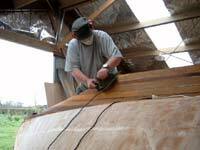 We need a lump of teredo worm proof hardwood for the worm shoe in the aft section of the keel. I expect to hear from Kerry this afternoon as to what he proposes to supply, and as its only about 1.4m long ( just over 4 ft) of 100 x 150 ( 4 x 6) we can take Charlies little station wagon and lay the back seats down to get it in rather than tow the trailer over and back. About Tuesday or so, we’re off the other way to check out some hard, close grained polyurethane foam with which to make the plug for the lead keel. That will be stacked up in the space left for lead, glued up into a big block and carved into the shape we need for the ballast keel. We will then put that “plug” complete with countersinks and holes for the keelbolts into a wooden trough and pour cement around it to make the mould. We’ll pull the foam plug out, put rods in to form the boltholes and get it all ready to pour about 3/4 ton of molten lead into it. That’s going to be an interesting day.